Many Zelda fans have wanted a moodier depiction of Hyrule ever since the release of Majora’s Mask and Twilight Princess, but recent installments have veered away from these darker settings. However, thanks to Bethesda’s Skyrim Switch port, you’ll now have the chance to cosplay as The Hero of Hyrule when traveling through the northern wilds of Tamriel. There’s something surreal about seeing the Master Sword used to lop off a bandit’s head, or finding the Hylian Shield drenched in blood following its impact with a Falmer’s face. There are three Zelda-themed items in the Switch version of Skyrim, so make sure you check out our guide below to ensure you don’t miss out on these Hylian goodies. 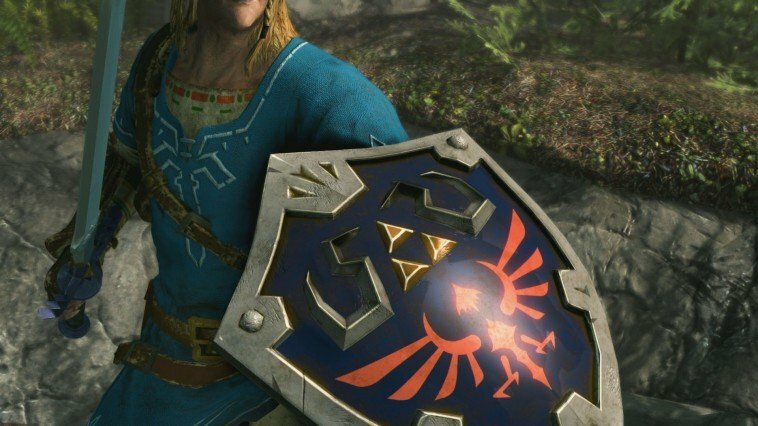 The easiest way to get your hands on the Champion’s Tunic, Master Sword and Hylian Shield is to use Skyrim’s amiibo functionality. Skyrim is compatible with pretty much all of Nintendo’s amiibo figures, but the Zelda amiibo in particular have a 20% chance of dropping one of the three pieces of Zelda gear. In order to use the amiibo, you’ll need to equip it. In Skyrim, amiibo functionality is used as a spell-like power that can be found in your magic menu alongside your shouts and other special moves. To access it, press the B button to bring up the menu and then scroll across until you see the magic tab. From there, select “powers” and here you’ll find your amiibo power. Once equipped, simply activate it by pressing the R button. Before you use this ability, make sure you’re outside and on a flat surface to ensure the chest containing your loot doesn’t get obstructed. You’ll know if it doesn’t work as you’ll hear a thud-like noise and nothing else will happen. When you get it right, a golden circle will be emblazoned on the ground and a chest will appear once you’ve scanned your amiibo. It’s important to note that you can only scan each amiibo once a day and the gear that spawns will be level-appropriate to your character. But even if you don’t have Zelda-specific amiibo, make sure you tap any amiibo on your Switch to receive some free gear. And who doesn’t like to get some free gear? If you don’t have any Zelda amiibo or want to simply obtain the Hylian gear naturally, then you’ll need to be prepared to traverse a very dangerous area of Skyrim. 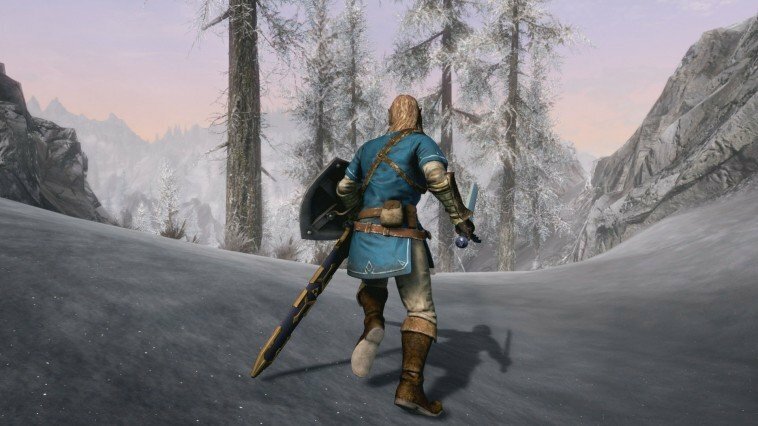 A chest containing the Master Sword, Hylian Shield and Champion’s Tunic can be found at the Throat of the World, which happens to be the tallest peak in Skyrim. The mountain can be accessed via the courtyard of High Hrothgar and is home to wolves, frost trolls, bears, sabre cats, and Ice Wraiths. Because of the danger these enemies pose, we advise you hold off collecting the Zelda gear until later in the game. However, if you can’t wait to stick your enemies with the pointy end of the Master Sword, then we recommend you begin your travels at level 10. The game’s main quest will also take you to the Throat of the World, so you’re bound to stumble upon the chest containing the equipment whether you go hunting for it or not. The items themselves will scale to your present level, which is also another great reason why you should level up your character before obtaining them. Without the amiibo functionality, you’ll only be able to receive these items once, so if you want to use Link’s trusty apparel during the late-game, you’re better off traversing this perilous peak later on.